The Protective Combat Uniform (PCU) is an interchangeable 15-piece, 7-level ensemble (the original block 0 configuration) that can be worn in layers appropriate for the mission. The PCU replaces the LEP. Wearing the PCU is a matter of mixing and matching the gray garments according to the anticipated conditions and activities of the user. 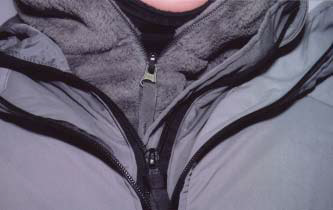 Comfort levels range from -50°F to 45°F, and although there are seven levels of protection, clothing in each level is not progressively added or removed the colder or warmer the environment. An insulative mid-layer jacket made from Polartec Thermal Pro High Loft fabric is water-repellent yet breathable. It is worn as an outer jacket in mild temperatures or as a heavy insulative layer in extreme cold. Seamless shoulders minimize chafe, which are then lined for extra warmth and padding for heavy pack straps. The soft windshirt is made from an encapsulated microfiber that repels water but also breathes for a variety of conditions. It is designed to pair with a next-to-skin layer for intense activity in cooler temperatures or with the Level 5 soft shell as a mid-layer. It stuffs into its own pocket for easy packing. The key to the entire system, this soft shell fabric jacket and pants are made with fibers encapsulated with silicone that are highly stretchable, windproof, water repellant and breathable (EPIC by Nextec). They are paired with Level 1 or 2 next-to-skin layers, ready for any cold weather aerobic activity.